House OKs Bill Making It Tougher To Keep 'Mentally Incompetent' Vets From Buying Guns : The Two-Way Critics of the bill say it could lead to more suicides — in one recent year, an average of 20 veterans per day died from suicide, according to the Department of Veterans Affairs. A House-approved bill would require a court hearing before a U.S. veteran is deemed mentally unfit to own a gun. 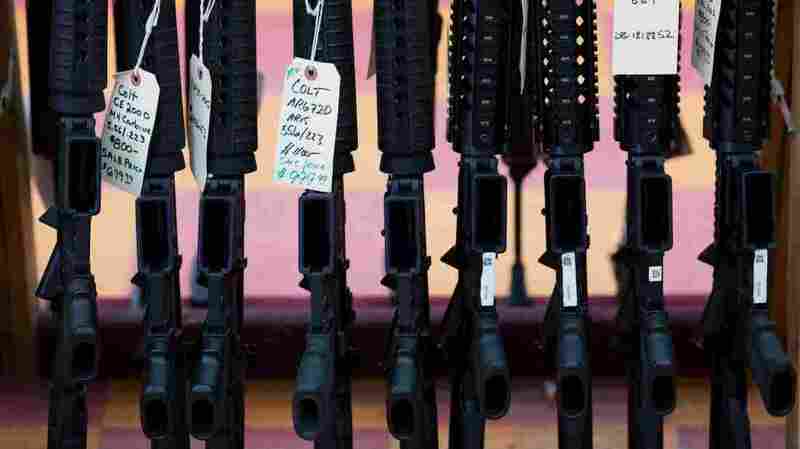 Here, rifles are seen at a gun shop in Merrimack, N.H., last year. The legislation would add a new hurdle to the process of blocking a veteran whose mental competence is in question from owning a gun. While the Department of Veterans Affairs currently adds the names of veterans it deems unfit to own a deadly weapon to a federal background check system, the bill would require a court hearing before that determination is made. "About 170,000 disabled veterans are deemed mentally incompetent by the VA," NPR's Quil Lawrence reports. "A VA-approved guardian makes some medical and financial decisions for them. Their names go on an FBI list so they can't purchase guns — House Republicans sponsored the Veterans' Second Amendment Protection Act to change that." Opponents of the bill say that easing gun ownership for mentally disabled veterans would make them a greater threat to themselves. As recently as 2014, an average of 20 veterans per day died from suicide, according to statistics released last year by the VA Suicide Prevention Program. Between 2001 and 2014, the VA said, the suicide rate among U.S. veterans rose by more than 32 percent. Backers of the bill, such as Rep. Phil Roe, R-Tenn., the chair of the Veterans' Affairs Committee, say it would help veterans avoid being caught up in a bureaucracy that can make it tough to remove a negative label. Roe also cited the importance of "removing the stigma of mentally ill people — that because someone is mentally ill, they're a danger to themselves or others." On the other side of the issue, Rep. Anthony Brown, D-Md., said, "When a determination is made that a veteran is mentally incompetent or incapacitated — for whatever reason — that determination is made to protect them, not to punish or deprive them." Critics of the bill include retired Gen. Peter Chiarelli, the former vice chief of staff of the U.S. Army. Speaking to Quil about why he opposed the bill, Chiarelli said, "Every single study you can read on this shows you that people in crisis — because suicide is such a spontaneous event — when they separate themselves from personal weapons the incidence of suicide goes down tremendously." "In any case arising out of the administration by the Secretary of laws and benefits under this title, a person who is mentally incapacitated, deemed mentally incompetent, or experiencing an extended loss of consciousness shall not be considered adjudicated as a mental defective under subsection (d)(4) or (g)(4) of section 922 of title 18 without the order or finding of a judge, magistrate, or other judicial authority of competent jurisdiction that such person is a danger to himself or herself or others. ".